Remember when you might have been able to have a Valentine's Day Party...along with treats...time to make boxes to house all of the Valentine cards in them...organize snacks and treats...well now those days are over for many schools...including mine. I do not LOVE wasting valuable instructional time so in order to find some time for fun I LOVE to add STEM to my Valentine's Day! 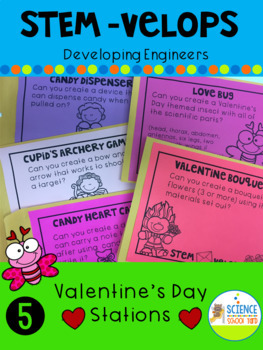 The best thing that I could have figured out as I teach all of our Kindergarten through Fifth Graders is that at times if I differentiate my big STEM Engineering Ideas I can set up one bucket, create different sheets that work for different grade levels, and when a holiday like Valentine's Day comes around I can be set to go hour after hour...all I have to do is replenish the materials used...and here's a BIG one...have each group that finishes with the bucket to leave it as close to the way they found it as possible! (I find that before we share out...they need to clean up because the group that cleans up first gets to present first. Here are some great ideas that can really be differentiated for multiple grade levels! Today was the best when a group of fifth graders were watching the presentations I recorded of the second graders and I heard them say how those second graders sure are smart because their ideas were amazing! The other weird thing was that our littles were able to work faster and more efficiently than our fifth graders as well! This one was so cute...I had them making flowers for someone they loved. Using paper, tissue paper, straws, pipe cleaners, glue, tape...the cutest part was when we got done one of my kiddos came over and gave me their flowers! So super adorable! So I did this one with second graders and fourth and fifth graders...the second graders were so very creative and were able to do it quicker than those older kids. Go figure! I gave them Styrofoam cups (other cups, too but they seemed to go to the Styrofoam), tongue depressors, candy hearts, tape, toilet paper tubes...I love how they could get the candy hearts to come out one at a time. This one really showed their creativity! Time for some Love Bugs! I love the heart shaped wings! Great review of the parts of an insect. Have them include a head, thorax, and abdomen, eyes, antennas, six legs...give them egg cartons, bottle tops, construction paper, pipe cleaners, straws, google eyes...Get them making a love bug for a love bug of theirs to give it to! Having them create a bow using plastic spoons and knives if you tape up the sharp parts, Craft sticks, Straws, Straws, Rubber bands, Paper clips, and good ole' masking tape! But, Let's talk organization... I love having the supplies in the bucket, but remember to have them clean up and recycle or throw away before they even put anything back in the bucket. Only reusable supplies and unused supplies get put back in exactly like they first saw it. I have them clean up before we share and line up. We have a quality control person (bucket brigade) that inspects the bucket and then brings in back to our central location. They are in charge of making sure the team is cleaned up! It works pretty slick! I will be sharing more tips for easy clean up in an upcoming post! Want it all in one place? STEM Velope Valentine Pack can be found here! I love these interactive holiday themed activities...just in time for Valentine's Day! Don't forget to sign up for our Science School Yard Scoop~lots of great extra freebies in your inbox as well as in our free resource library!